The Guild meets at 6:30 pm on the 4th Monday of every month except in May. In May we will meet the third Monday. We do not meet in December. The meetings are held in the church’s social hall. Enter at the door that sits back from the street to the left of the church sanctuary. Note: The Highway 49 Bypass opened in early 2007 and it BYPASSES Sutter Creek. The town is on what is now known as "Old Highway 49". Many maps and internet map sites do not yet show the bypass. If you are driving South on Highway 49 from Placerville or Sacramento, watch for the turn off sign for Amador City and Sutter Creek about two miles south of Drytown. You must make a left turn off of the bypass to stay on Old Highway 49. If you are driving on Highway 49 from Jackson, watch for the signs for Amador City and Sutter Creek. You must make a right turn off of the bypass to stay on Old Highway 49. 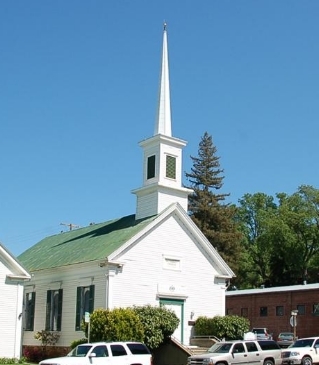 Sutter Creek is where it always was, and is still a lovely, quaint place to spend a day or a weekend, just don't forget to turn off the Bypass!